Each kit includes clear plastic badge holders and sheets of white laser and ink jet compatible badge inserts. Ideal for meetings, seminars and more. Microperforated badge inserts tear cleanly, leaving smooth edges. Preset layouts in popular software programs make formatting easy. Top-loading 3 x 4 pouch is welded on three sides to hold badge insert firmly in place. Each kit includes clear plastic badge holders and sheets of white laser and ink jet compatible badge inserts. Ideal for meetings, seminars and more. 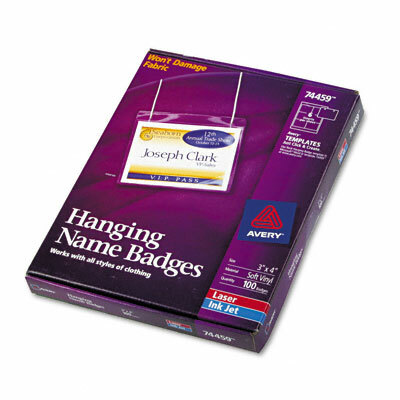 Microperforated badge inserts tear cleanly, leaving smooth edges. Preset layouts in popular software programs make formatting easy. Top-loading 3 x 4 pouch is welded on three sides to hold badge insert firmly in place. Won’t damage fabric.